I am running out of spices and looking forward for my trip to Singapore very soon. Need to go back and indulge myself with some hawker food that I missed dearly. Another reason is to stock up some spices for my future trips. With the shortage of spices, I decided to make this dish call begedel that I think I can pull it off by cutting some corners and still make it taste decent. I have no idea what begedel is call in English and I am lazy to search in the Internet. So I will just give it an English name myself. Since this is my blog, I think I am entitle to do that. 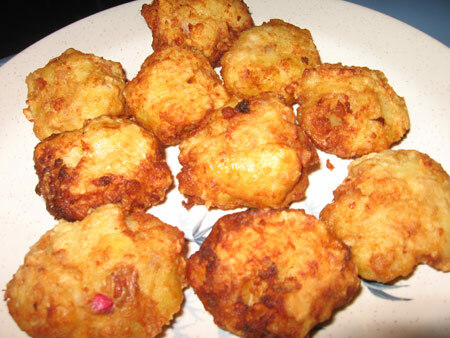 I shall call it Rounded Mash Potatoes Fritters with beef meat. There you go, begedel got a new English name. ( Pronounce as Burger Dell ). Begedel is a Malay dish and I’ve eaten it in Indonesia, Malaysia and Singapore as well. 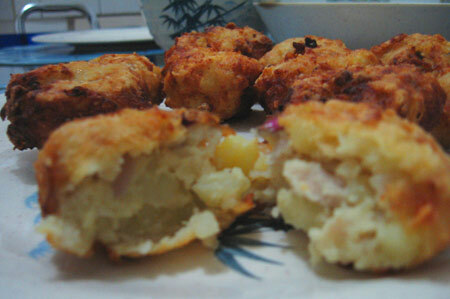 Here is how I made my Rounded Mash Potatoes Fritters with beef meat ( Begedel ). Attempting to take a nice picture of a cracked open begedel to show the filling inside but fail miserably. Even without some other spices like white cumin powder and cumin powder, the Begedel still taste pretty all right with onion, beef, salt and pepper. Fried food is always safe as it is universally accepted. Also the shape of my Begedel not as nice as the ones I had in Indonesia. This is because you need to practice all the time to make the shape nice and even. But I am happy with the result once again as I am not a trained chef.